Well, I like to maintain an air of mystery, but… 📣 YOU CAN FIND ME ON GOODREADS HERE AND TWITTER HERE 📣. My name is Zoe. My pronouns are she/her. I’m a teenager, so if any adults or children feel uncomfortable interacting with me on this or other platforms I totally understand! It’s totally a personal preference, and in this house we respect people and their wishes! 💛 Tbh, even I hardly ever talk to other teenagers, but let’s be real, this is because I’m antisocial. I aim for about 4-6 posts a month, but sometimes life gets in the way. What do you post on your Twitter and Goodreads? On Twitter, I tend to get more political, BUT I also get more MEME-Y, RETWEET-Y, AND DUMB-Y, so prepare yourself for that. On Goodreads, I track and update people on my reading progress, whilst attempting to be vaguely funny (maybe?????). Who are your favourite bands/musical artists? Um, I know I inserted this question into the Q&A, but it’s still hard to choose! Okay, okay, I get it, this list is really pathetic and horrible, but I’M WORKING ON IT. What things might you talk about on this blog? 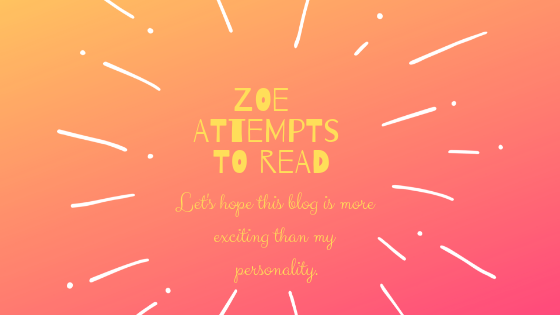 Primarily, this blog is going to be about books and bookish things. However, I do have a mental illness/disability, so that’s fun, and something I talk about occasionally.